Meet Sarah Jones and Chris Mohring. Are they not just the cutest couple you've ever seen? I have not had the pleasure of meeting the groom to be, but feel super connected to him through Sarah. Sarah is a former colleague of mine. We both graduated in Fine Arts from Louisiana State University and spent much of our studio lab hours together, covered in ink and elbow grease. I'll be honest. I was beyond thrilled and honored really when Sarah contacted me to design her wedding stationery suite. Sarah Jones was entrusting me with one of her wedding planning elements and I KNEW stationery was on her top three most important to-do's. Sarah majored in Printmaking back in college and had such a talent creating these magnificent sheets of paper, using that paper for sculptures and installations for gallery shows. We hadn't talked much since graduating other than tid-bits through social media. So I was thrilled and filled with a bit of nostalgia reminiscing about old print lab days at LSU. I cannot tell you how many time I physically squealed after reading one of our emails. When she mentioned that the design process uprooted her old art life, I may have actually teared up. Okay, I did. Sarah had pulled out some old paper installations to sketch some ideas of using them as a repurposed installation behind her head table at her and Chris's reception. Speaking of the venue, this barn. THIS BARN. The White Sparrow Barn sits in an open field in Union Valley, Texas and is the most charming barn my eyes have ever seen. Part of the process of custom designing a stationery suite includes inspirations from colors, florals, and sometimes the venue itself. Once I heard the words "The White Sparrow Barn" from Sarah, I issued another squeal. I had about one hundred and one ideas floating around in my head, but knew I wanted to tie in the handmade paper to Sarah's past and that simplicity and the work of the hand would best suit this suite. A simple shade of grey ink, handmade cotton rag paper, hand illustrated barn sketch and lettering ...and we have Sarah and Chris's save the dates. The wedding day stationery that will follow, well, we will just save that for another day. ...and there goes another squeal. A special shout out to Texas photographer, Chloe Gonzales. She beautifully captured the essence of these two for their engagement shoot. I am looking forward to being smitten all over again with the upcoming wedding photos! Blake and Lauren. Blake and Lauren have been a couple for as long as my husband and I. Graduating from the same high school, marrying our high school sweethearts ...a common small town love story. I've curated lots of work for Lauren's hosted parties over the years, so when her and Blake became engaged, I was over the moon to work together on her biggest hosted event yet! After our initial chat, I knew she'd want to pair simplicity with a little something extra. One of the first sentences out of her mouth: "I think I want to add some bling." My initial thought was to tell her she was crazy, but I knew we could do this right. There is certainly a tasteful way to incorporate shimmer and shine. Lauren and Blake are having a traditional Catholic wedding mass and wanted the stationery to reflect the formalness of the church ceremony. The design was based around a subtle boldness, two opposite words that complimented each other so well through out each wedding piece that completed this suite. The black text was balanced with luxe blush pink and soft white envelopes. ...the shimmer was just the perfect icing on the cake. 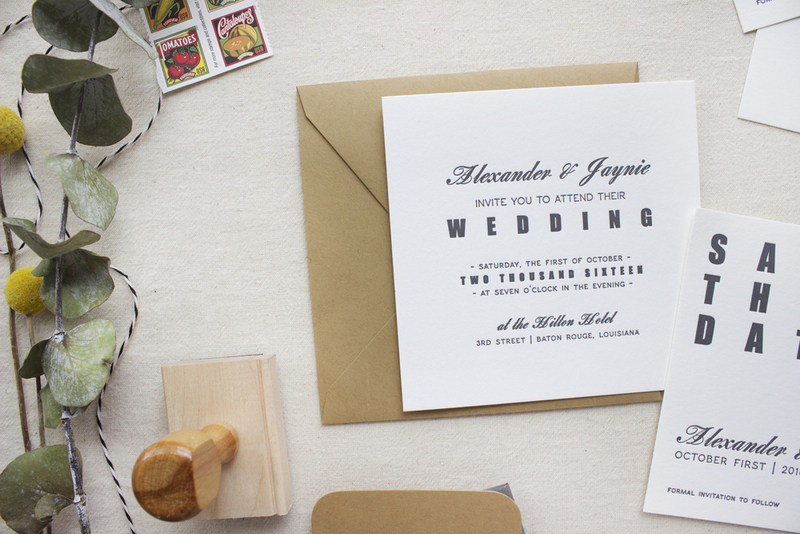 The invitations and response cards were letterpress printed on cotton paper. 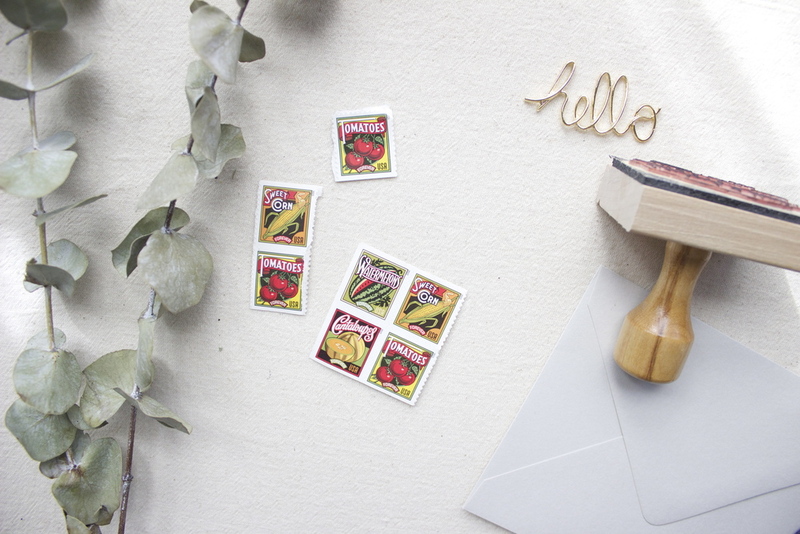 The envelopes looked luscious with a shimmer envelope liner that really made the piece pop. All wrapped up with a letterpress printed seal mounted on a black band, this suite was complete. Lauren's wedding shower invitations were the preface to the wedding stationery. A softer grey and a touch of floral gave Lauren's guests a visual sneak peek to the wedding stationery that was soon to come. Then, the programs added the appropriate accessory pieces to really finalize this whole "black, blush, and shimmer" wedding stationery suite. Wishing the future Huvals the happiest of all wedding days this weekend. I'm sure the wedding will sparkle as much as the sweet couple and their stationery. All my love to these two! Almost a year ago, I contacted The Keeping Room in Baton Rouge in hopes for some interest in carrying TLBC's product line. Many clients and friends have referred me to this shop, so I thought, well hey, let's check it out. After speaking with Amanda, the owner, we trained off on how I got started and where I have my work printed. I told her I own my own letterpress printing business. This conversation lead us to a collaborated wedding stationery album. After months and months of preparations, designing, testing, and of course printing, TLBC and TKR has combined our efforts and talents to create ten, one-of-a-kind wedding collections. ...with full intentions of watching it grow to more. I got the bright and crazy idea to bring my first table-top press along for a ride. I really wanted everyone to get an idea of the process that goes behind letterpress printing. Success. Our guests were able to pull their own print and got a feel (literally) for the labor that goes behind printing. Of course, the work is done on a much larger press, but the concept all the same and I believe everyone left with a new appreciation for letterpress printing. This collaboration has really lead us to focus on supporting local businesses. The in-house customer service and one-on-one attention we are able to give each couple establishes a more personal relationship that doesn't end at the wedding day. The evening was absolutely lovely. If you didn't get a chance to stop by, don't fret, The Keeping Room isn't going anywhere. Stop by their beautiful shop off of Perkins Road and ask to see the new album! I am looking forward to working with TKR and new couples to tailor each suite to their ideal wedding stationery. Ode to new adventures!